When it comes to surf fishing, it’s hard to beat the coastline of North Carolina. Well known for hundreds of miles of beaches where record-breaking catches are landed on a regular basis, the North Carolina shoreline is arguably one of the top destinations for surf fishermen from all across the country. So if you are new to the N.C. coastline, or just want to brush up on your surf fishing insight, take a closer look at everything you need to know about casting from the coast, and get ready for plenty of opportunities to reel in the catch of a lifetime. Every state has specific rules and regulations in place to help manage natural resources, and North Carolina is no different. One of the ways these conservation efforts are funded is through saltwater fishing licenses, which help to support fisheries management programs, like hatcheries, habitat research, and fish stocking. Licenses are sold via the North Carolina Wildlife Resources Commission, and can be purchased online at https://www.ncwildlife.org/. In addition, licenses can be purchased at the majority of local bait and tackle stores throughout the N.C. coastline, as well as at major sporting goods stores. A license is required for all anglers over the age of 16. The coastal recreational fishing license allows anglers to fish in all coastal waters, but not in inland, fresh waters. A separate license – the Unified Fishing License – will allow anglers to fish in all waters across the state. A fishing license is not required for clamming or harvesting oysters, as the license is only required for finfish species. Once you have your coastal recreational fishing license in hand, it’s time to start thinking about gear. Anglers will find tons of options when it comes to equipment for casting into the surf, from custom designed rods and reels at local tackle shops, to name brand varieties that are designed for multiple areas along the coastline. We were not provided with free or discounted products to review. These recommendations were not influenced by manufacturers. We did, however, heavily consider customer reviews at retail websites when deciding which products to feature. We like these products, but we took care to make sure other customers agree. Some of the product links include affiliate codes. If a purchase is made, OuterBanks.com is paid a commission for the referral. Surf fishing in North Carolina is naturally affected by the weather. Different species can be abundant or non-existent depending on so many natural factors, such as the season, the weather, the tides, and the inherent shape of the shoreline itself. If you want to know what to target, and how successful you’ll be when you start casting, then you need to know the fundamentals of a North Carolina beach when it comes to surf fishing. Here’s a little insight on the basic elements that impact surf fishing from Duck to Oak Island and Holden Beach, and how you can use these varying factors to your best advantage. A number of saltwater species that frequent the North Carolina coastline are seasonal, which means that they are always on the move as they migrate up and down the coastline. The always popular red and black drum are notorious for this movement and seasonal appearances, as they can be found in droves when the conditions are just right, and they en route along the East Coast. A good rule of thumb when it comes to seasonal and migrating species is that they tend to head north for the summer, and tend to head south for the winter. This is why the late spring, early summer, and fall are arguably the best times for surf fishing in North Carolina. During these times of year, anglers have the best chances of reeling in migratory catches, as well as local species that are at their most abundant close to shore when the water temperatures are warm. Ideal weather conditions for surf fishing can be tricky to pinpoint because there are all sorts of different factors to consider. An onshore breeze can provide an increase in larger fish swimming closer to shore, but conditions that are too windy can affect the clarity of the water, and can make surf fishing difficult. Needless to say, rain can also hinder the water quality, and can make a day of surf fishing a soggy experience. On the whole, aim for sunny days with a light onshore breeze. A low pressure is considered preferable to a high pressure during a spring tide, and if the weather conditions aren’t conducive for fishing, (like extremely windy days, or where there’s an offshore hurricane in the area), and the conditions have been poor for more than a day, it’s best to wait a day or two before heading out to the beach again. It typically takes at least a day for fish to acclimate after a bout of severe weather, and to return to the waters close to shore after the bad weather has subsided. Tides have a major influence on surf fishing all along the North Carolina coastline, and a general rule of thumb is that high tide is better than low tide, simply because it’s easier to reach deeper waters with every cast. Try to aim for high tide, or up to two hours before or after a high tide. Slack tide – or the time period right in between low and high tide – is generally not as productive for surf fishing. As for time of day, early morning and dusk are typically when a number of varying species feed. So head out to the beach before 9 a.m. or about an hour or so before sunset. Not only will you miss the sunbathers and other beach crowds, but you’ll also have the best chance of taking advantage of the nocturnal feeding habits of a wide array of saltwater fish. Experienced surf fishermen can generally tell if a beach is good for fishing with just a few casts, or even a quick look. Considering that the North Carolina shoreline varies greatly with every mile, there are a few things to look for when it comes to determining if your stretch of sand will be a solid fishing spot. Sloughs – A slough is a deep trough of ocean water that is located close to shore and which runs parallel to the beach. A slough can be a haven for all varieties of saltwater fish, so casting into this trough can yield great results. Look for waves that are breaking offshore, and then dissipating before they get closer to the beach. (i.e., an outlying sandbar that grows deeper close to the shoreline.) This will be a sign that there’s a slough present, and it’s a good beach for fishing. Sand and depths – As a rule of thumb, the deeper the water is close to shore, the better your luck will be at surf fishing. Look for beaches with steep slopes and soft, course sand, which indicate that the adjacent ocean shoreline has a steep and deep slope as well. Also, look for waves that are breaking close to shore – or hardly any waves at all – to determine if the ocean waters are nice and deep next to the shoreline. Wild waters – If you spot a collection of birds or other wildlife congregating in one location on the open waters, chances are that they’re feeding on a passing school of fish. As such, this is always a good indicator that the fishing conditions are currently exceptional. Jetties, piers, and bridges – At multiple points along the coastline, jetties, bridges and piers can be popular fishing spots, simply because the presence of underwater structures attract so many different varieties of fish. In addition, a bridge - (like the Little Bridge in Manteo or the Bonner Bridge just south or Oregon Inlet) - can allow anglers to cast into deeper waters, well away from the shoreline. Inlets – Inlets are notoriously productive fishing grounds as the deep and steady currents allow multiple species of fish ample opportunities to access varying fishing grounds in the ocean or sound. Head to the edge of a sound or oceanfront beach on the edge of an inlet for surf fishing at its arguable best. When the weather conditions aren’t right, surf fishing can actually be a potentially dangerous sport. To mitigate the odds of injury, stick to the following tips that will ensure you remain safe on every trip to a North Carolina beach. Never fish alone, and if that’s not possible, always let someone know where you’re going. Use mile markers and landmarks to indicate where you’ll land along the beach, and keep this information handy in case an emergency occurs, and you need to call for help. If you’re taking a 4WD vehicle to go surf fishing, be sure and air down your tires to 20 psi at most, and never park below the high tide line. If you get stuck, and you’re below the tide line, you may damage or even lose your vehicle to approaching ocean waves and saltwater. Watch out for swimmers, surfers, and other beach-goers who may be sharing the shoreline. Use caution in inlets, and at beaches known for their currents and constantly changing conditions, like the famous Cape Point on Hatteras Island. Never wade too far out into an inlet, and avoid walking on inlet sandbars when there is an incoming tide, as they tend to disappear quickly as the waters rise. Bring sunscreen! The intensity of the sun increases along the beach, as the sun is reflected off the ocean waters. As a result, sunscreen is a must all year long, despite the outdoor temperatures. 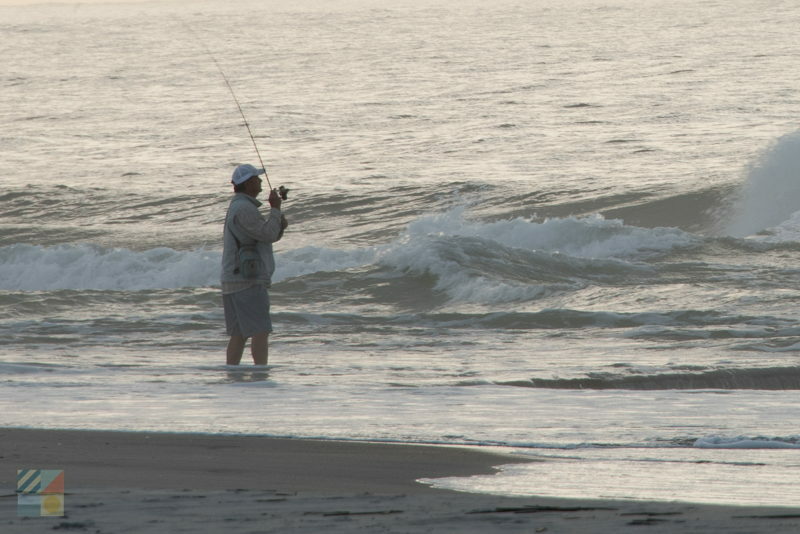 There are several techniques when it comes to casting, hooking, and reeling in fish, which depend on where you land along the North Carolina coastline. How you fish from a pier will likely be different from how you fish from along the shore, and there are a myriad of considerations to keep in mind for both types of saltwater fishing. 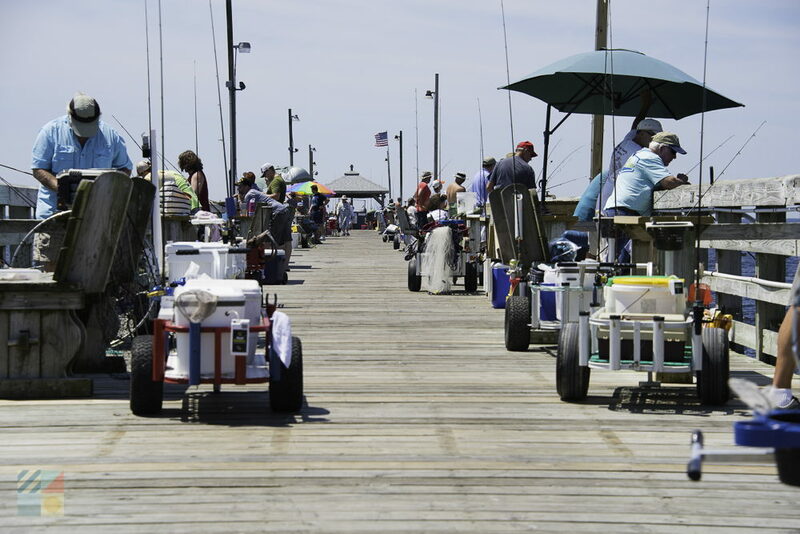 Pier fishing is popular in coastal North Carolina simply because it is so plentiful, and can have so many big rewards. There are multiple fishing piers located in every developed corner of the North Carolina coastline, which includes the Outer Banks, Hatteras Island, the Crystal Coast, the Cape Fear area, and the Brunswick Islands, so no matter where you land, (with the exception of isolated barrier islands like the Cape Lookout National Seashore), chances are that you’ll be close to a local fishing pier. A saltwater fishing license is also not required to fish from a North Carolina pier, and many piers offer on-site bait and tackle stores, convenience stores, or even full-service restaurants and bars. But the primary benefit to fishing off an oceanfront pier as opposed to a local beach is all about the location. 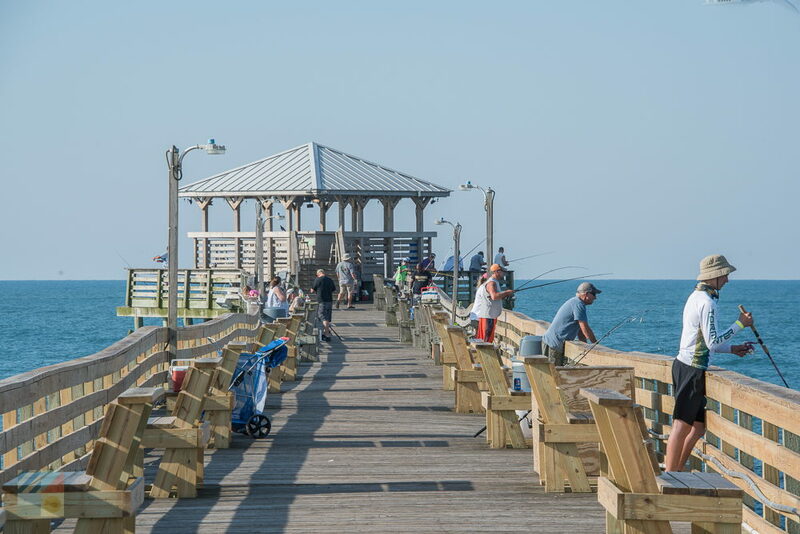 The fishing piers on the North Carolina coastline can extend anywhere from 600’ feet to 1000’ feet or more into the Atlantic Ocean, which means that you’re that much close to the big catches that are found slightly offshore. In fact, in the summer months, it’s not that uncommon to hear reports of dolphin or even wahoo catches, which are offshore species that tend to trickle in closer to the beach when water temperatures are high enough. Keep the following in mind on your next pier fishing trip to maximize your chances of reeling in plenty of catches. Don’t cast too far – One of the best things about pier fishing is that it doesn’t require much effort when it comes to casting, as fish are naturally attracted to the underwater pilings and structures that are directly under the pier. Watch the birds – Birds hang around oceanfront piers for good reason -they’re looking for fish, just like you. Watch the birds and see what areas of the surrounding waters they tend to target for the best chance of finding fish in the immediate area. Look for changes in the water – Fish are naturally attracted to changes in the water, so look for areas where the water goes from cloudy to clear, or from dark to light. Bring polarized sunglasses – Not only will they protect your eyes from the hot sun that reflects off the surrounding waters, but they’ll help you spot fish that are well beneath the surface in deeper waters off the pier. Look into pass options – It costs money to go pier fishing, but if you regularly fish from your local fishing pier, it may be worth it to look into seasonal or annual passes. Long-term passes for a week, month, or even a year can save you big in the long run. If you don’t know what’s biting, ask! The folks who man the North Carolina fishing piers know their stuff. Ask for recommendations on bait, rigs, and what’s biting and when, to boost your chances of success. 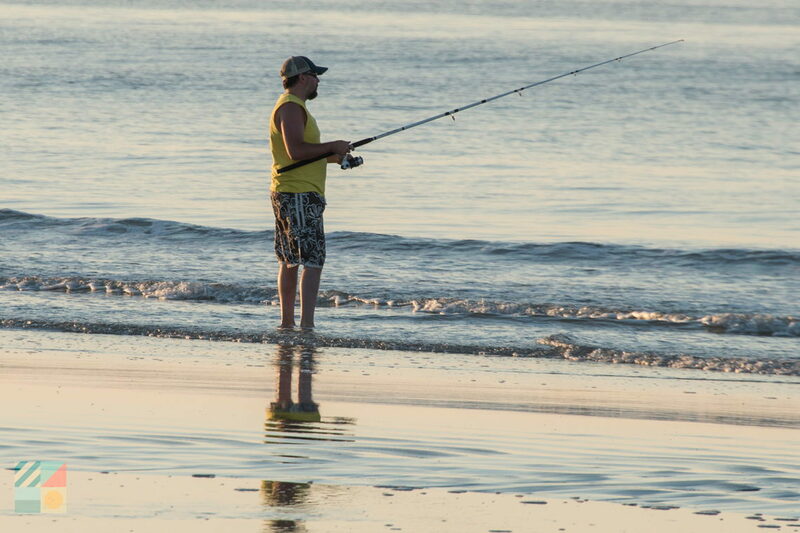 Surfcasting, or beachcasting, is easily the most popular form of fishing along the North Carolina coastline, simply because it can be done on any stretch of shoreline, and in any weather. With the exception of seasonal closures for endangered bird or sea turtle nesting, all stretches of the North Carolina shoreline are open to anglers, which literally gives fishermen hundreds of miles of options when it comes to finding a spot to fish. The benefits of surfcasting are endless. It’s easy, convenient, and can be done anywhere, and as far as fishing goes, it’s the least expensive type of fishing you’ll find along the oceanfront shoreline. Perhaps best of all, it’s a sport that can be enjoyed by anyone – regardless of age, skill, or familiarity with the beaches of North Carolina. With that being said, there are a few tips, tricks and techniques that anglers can keep in mind to make their surfcasting as fruitful as possible. Find a solid rig – Many experts attest that the best surf fishing rig set-up is the Fish Finder Rig, which is easily one of the most popular rigs for surf fishing along the North Carolina coast. Do some recon first – Head to your local beaches around low tide and look for sloughs, deep waters, dips, sandbars, and structures, which will all indicate great fishing grounds when high tide rolls around in few hours. Take the truck – Anglers can cover more ground, (especially during initial recon missions), if they utilize a 4WD vehicle to explore the area beaches. This is especially true for hard-to-reach but popular surf fishing beaches like Cape Point on Hatteras Island or Ocracoke Island and Cape Lookout National Seashore. Best of all, it’s easier to haul all your gear to the shoreline. Buy a rod holder – Makeshift rod holders that are made out of buckets, coolers, or holes dug in the sand itself may be cost effective, but they won’t hold your rod very well if you get a big bite. Invest in rod holders, or at the very least, get some cut PVC pipe if you want a do-it-yourself variety. Don’t overdo the cast – The fish may be closer than you think, and this is especially true in areas that have sloughs close to shore. Aim for deep waters, and not just waters that are far away from the shoreline, for the best results. Be an early bird or a night owl – By arriving to the beach early or late, you’ll have the best chance of catching fish that feed during these times of day, while avoiding swimmers, surfers, and other folks enjoying the shoreline. Look for fishing crowds – The locals know where to go, so if you see a dozen of more fishermen congregated in one spot, then chances are you’ve stumbled upon a good fishing hole. Just don’t set up too close to people who are already fishing – nothing ruffles a local fisherman’s feathers more than getting their lines twisted with a new arrival. Practice close to inlets – The good thing about fishing near an inlet is that you don’t have to cast very far to reach potentially deep and fruitful waters. So if you’re new to surf fishing and haven’t perfected your cast just yet, try heading to the beach close to a local North Carolina inlet for the best results. Just don’t wade out very far, if at all – inlet waters can be deceptively swift and are ever-changing. One of the best things about surf fishing in North Carolina is that every season and stretch of shoreline changes. What you’ll catch in the winter months is often distinctively different than what you’ll land in the summertime, and what you might catch in a warmer region like Oak Island could be different than what you’d catch along the Currituck County beaches during identical times of year. With that being said, there are a variety of popular saltwater species that can veritably pop up anywhere along the coastline, from the northern Virginia border, to the southern South Carolina state line. So when you go surf fishing, be on the lookout for these types of fish that frequent the ocean waters off the North Carolina coast, and which are popular and sometimes coveted catches for local and visiting fishermen alike. How you’ll catch them: Light tackle works well, especially with live bait such as worms, shrimp, or squid. Where you’ll find them: All along the beaches when the drum run is on. How you’ll catch them: A bottom rig with a sinker, and plenty of live bait – no artificial lures for this species. Where you’ll find them: By surf fishing anywhere along the coastline. Spot fishing works too when the drum arrive in droves. How you’ll catch them: Cut bait or live bait seems to work best. How you’ll catch them: Bottom fishing on cut bait or artificial lures. Watch out for their teeth, which are razor sharp. Catch Limits: Regulations change based on season and number of fish caught. See http://www.ncmarinefisheries.net/web/mf for more information. How you’ll catch them: Live bait – especially mullet – works well. Chumming is a good option too. Where you’ll find them: Pompano frequent the beach close to shore, just past the breaking waves. Especially common in clear and warm ocean waters. How you’ll catch them: Bottom rigs with natural bait, like sand fleas, cut mullet, or shrimp. Where you’ll find them: On the bottom of the ocean floor. Use a bottom rig, or try flounder gigging. How you’ll catch them: Both live and artificial finger mullets work well. Where you’ll find them: Head to the end of the pier! Where you’ll find them: Piers are great for sea mullet, but you can also find them all along the beach. How you’ll catch them: Use a bottom rig with two hooks and live bait, such as shrimp, sand fleas, squid, or blood worms. How you’ll catch them: Just about any kind of rig will work, but try casting or jigging with artificial lures such as spoons. How you’ll catch them: All rigs work well, but be careful reeling them in, as the aptly named “weakfish” has a weak mouth that can tear the hook through the lip. 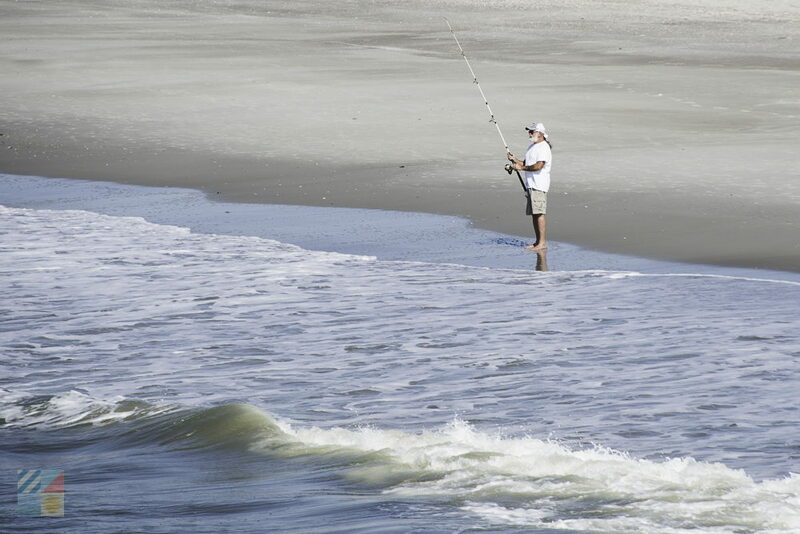 Surf fishing in North Carolina is arguably one of the best and most popular activities on the beach. Enjoyed anywhere, and at any time of year, surf fishing can be a great way to spend lingering days along North Carolina’s hundreds of miles of stunning shorelines. From the isolated barrier islands of Hatteras Island and the Cape Lookout National Seashore, to the bustling beach towns of Carolina Beach, Oak Island, and Nags Head, any stretch of sand can yield some spectacular results. So be sure and bring along your gear, your fishing license, and your luck – you never know what you’ll land when you try surf fishing in North Carolina.